Dante’s Inferno gamers already know that the game is available for Xbox 360, PSP and PS3. Bright Hub’s own Dante’s Inferno Review gives these versions an enthusiastic ‘thumbs up’ rating. Gamers who prefer social networking sites to gaming consoles can also partake in Dante’s Inferno, albeit in a much tamer version of the console blockbuster. It is interesting to note that gamers on the application’s Facebook page seem to either love or hate the Dante’s Inferno game. The defining factor – for most – is the creation of factions that determines the speed and overall ability to progress within the application. While this appears to be a sticking point, there are ways to make playing the game fun and enjoyable and get a good start if playing for the first time. Begin Dante’s Inferno game-play by choosing a player class. The options are ‘anger,’ ‘greed’ and ‘lust.’ Unlike the vices they represent, these classes determine the edge the newbie player experiences. For example, ‘anger’ allows the newbie to regenerate battle-readiness at one virtue point per one minute and 49 seconds. For the battle aficionado, this is the way to go. ‘Greed’ provides the player with a quicker collection of souls (the currency of the game) while ‘lust’ heightens the regeneration of energy at the same rate as ‘anger’ speeds up the virtue points. This makes ‘lust’ a good second choice for the more missions-oriented player. Dante’s Inferno missions earn souls, experience points and relics required for other missions. Requirements for various missions differ; what frustrates players is the fact that some missions require a certain faction size while others demand a certain number of battles won before proceeding. For example, Mission Tier 2.1 (consisting of five tasks with three levels of completion each) features the mission ‘Sharpen Your Scythe’ which requires – in addition to artifacts – 15 successful battle encounters. The task ‘Dash Across Charred Ground’ demands the presence of four faction members. Newbies to the game will be wise to gain faction members early and battle extensively early on as well. This permits for a collection of battle wins that secure the unhampered progression in the game-play later on. 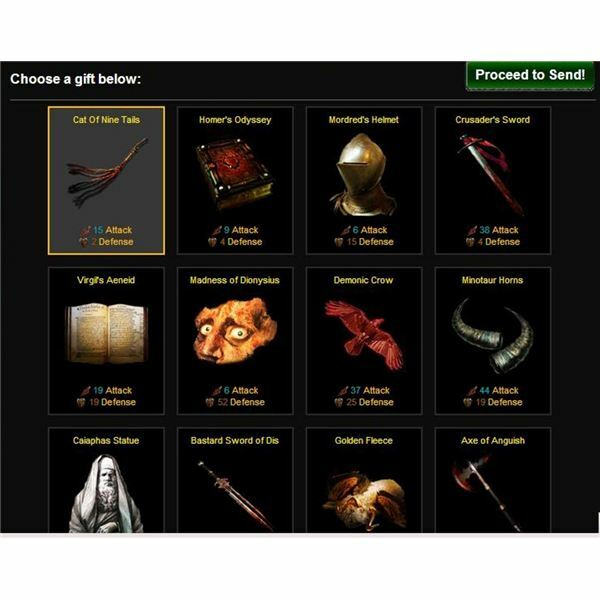 Items that are required for the tasks may be purchased at the Dante’s Inferno game Devil’s Dealer with souls earned in battle. Battles earn experience points, souls, and hellions. When comparing Facebook’s Dante’s Inferno game to its Mafia Wars application, it quickly becomes apparent that while the latter is heavily reliant on mission-play, the former demands a succinct battle strategy, which makes it a less enjoyable game for players who loathe the battle aspects. Without boring the battle-hungry newbie with mathematical calculations, it is noteworthy that during early leveling up, resulting skill points should be divided between max virtue and attack and defense points. Dante’s Inferno game developers set up battle functions to multiply the number of attack points by the number of faction members, but only in keeping with the player’s level. Thus, a level 30 players only has 30 effective players that enter the multiplication, even if his faction contains in excess of 100 members. Thus, even smaller factions can pack a mighty punch, if the gamer remembers to increase his attack points faithfully. Note that, much like in Facebook’s Vampire Wars game, the battle winner can sustain significant damage. Dante’s Inferno players frequently voice frustration that buying much-needed relics from the Devil’s Dealer takes too much time. Mission and battle payouts are low; the cost of relics is high. A good example is the Lust Minion hellion, which costs 5,963 souls and comes into play in Mission Tier 2.2. In contrast, payouts of the missions in this tier range from 187 to 329 souls. Artifacts generate souls, albeit at a slow but steady pace. Newbies will do well to spend their hard-earned souls on artifacts early in the game. It is noteworthy that collection stops after about 48 hours, and the player should return just to harvest and store souls, even if she will not play at that time. Another important aspect of the previously mentioned faction creation is the ability to send gifts. Make good use of it and request gifts in return. They assist in battle and reduce the need to buy weapons so that the player may use souls to purchase relics for missions instead. Dante’s Inferno on Facebook is still a lonely game. 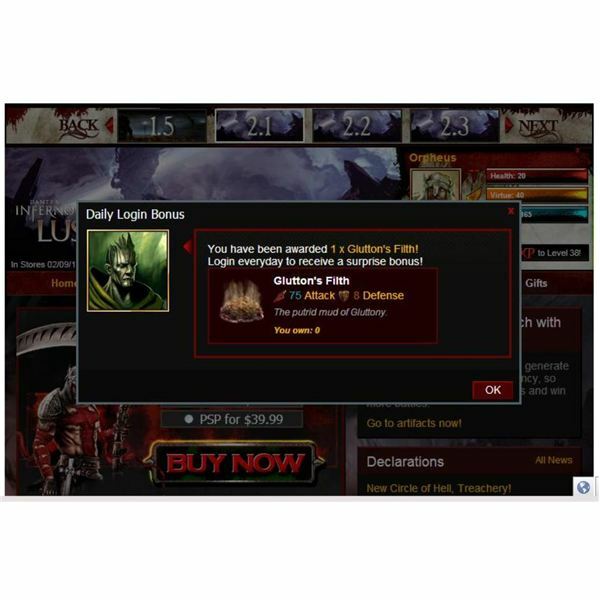 Unlike Mafia Wars or the game-play banter and interconnectivity of clan members in Vampire Wars, faction members in the Dante’s Inferno game are largely a mathematical component and sources of gifts. This causes some newbies to neglect faction building early on. Returning players will be surprised to learn that the ease with which they – before January’s major game overhaul – breezed through the missions has now been slowed to a snail’s pace. Tasks have higher energy demands while featuring significantly lower payouts. Adding insult to injury, there are now three levels of completion rather than just the initial one. Battle players notice that the attack and defense stats of weapons have been adjusted and previously winning combinations now fail to yield the blows they did when Dante’s Inferno first made its Facebook debut. That being so, the attack and defense stats now make up for these changes, and the new or returning player must beef up these stats for enjoyable game play.